Call it a journal. Call it a diary. 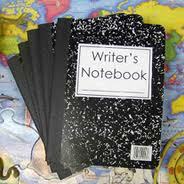 Call it a writer’s notebook. Call it what you will. If you are contemplating or working on a major writing project like a memoir or family history you should keep one. Keeping a writer’s journal fosters creativity. Psychologist Susan Perry in an article in Psychology Today said, “To free your creative self, suggests Janet Burroway in her popular textbook Writing Fiction: A Guide to Narrative Craft, you must give yourself permission to fail.” Said Burroway, "The best place for permission is a private place and for that reason a writer's journal is an essential, likely to be the source of originality, ideas, experimentation, and growth." We’ll explore why so many of our greatest writers have found journals so valuable and how you might get the most out of one of your own in upcoming posts.